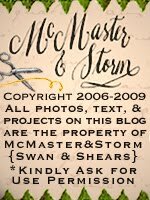 mcmaster and storm: McMaster & Storm; some history. McMaster & Storm was started by two friends, Kara and Darcy, in the spring of 2005. Prior to starting McMaster & Storm Kara had a store in Turlock, California, Paris Flea Market, and Darcy had a store in Piqua, Ohio, The Clay Pot. Kara and Darcy found an appealing storefront in downtown Greenville, Ohio (http://downtowngreenville.org/) a small town northwest of Dayton, Ohio. Greenville is the birthplace of Annie Oakley, Little Miss Sureshot, and the downtown is part of the Ohio Main Street Program. 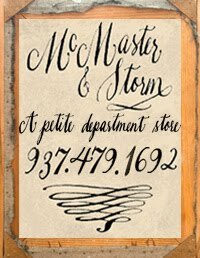 The name of the store, McMaster & Storm, came about by combining two surnames from the store owners' ancestry. McMaster & Storm is a mix of new merchandise and vintage items. The store offerings range from European soaps, linens, and Opinel knives, to antique lighting and furniture pieces.